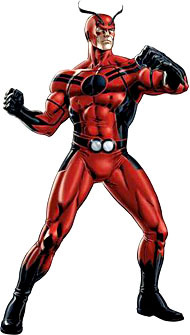 From 60-foot goliath to insect-sized hero, Henry Pym has unlocked power that will change the world! There's a great bit in Avengers: Rage of Ultron where Hank ponders his own life: "I remember hearing Stark describe me to a new Avenger once, when he thought I was out of the room. 'Imagine if self-doubt was a person.' It hurt. I'm a co-founder of the Avengers. But none of them respect me. Even when I'm right - they wither rather than acknowledge it. Unable to mask their dismissive estimation of me. After all I've accomplished - why do they still look at me as if I'm lucky to be here? What is so broken about me? So unlikable? Why does it still hurt? It didn't get better with age. Only more pronounced." Kind of tells you everything there is to know about him. 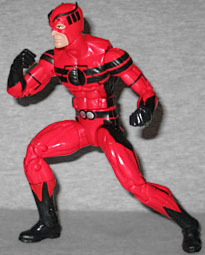 There have been three Marvel Legends of Hank Pym before: Goliath, the Series 4 chase figure; the Walmart-exclusive BAF; and Yellowjacket. This one is wearing his most recent costume, which debuted in Avengers Academy #7. It's red and black, and has patterns that call to mind his classic outfit. Unfortunately, there are several graphic elements - for instance, the thin lines on his chest and arms - that work in art but don't work as well when they're applied to a physical object. 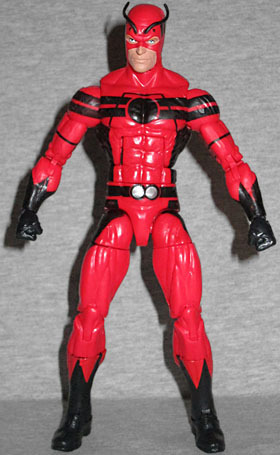 Possibly because the figure's joints already look like thin black lines, rather than being a solid field of red. 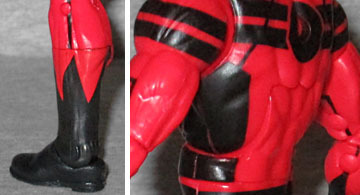 Also, his belt is off-center, and his left shin has been painted incorrectly: the black of his boots is supposed to come up and join with the line running up the outside of his leg, but it doesn't; instead, the "high" spike has been painted on the inside of his shin, dead-ending when it reaches the joint. Finally, the stripes on the shoulders can't line up with the ones on his chest and back at the same time. Part of Hank's new costume was a pair of antennae on his forehead. The toy has them - they're on a plug that's glued into the forehead - but they get squashed down against his head by their time in the tray. They're soft PVC, though, so you can flex them out to whatever degree you like. A little warm water will help. It may seem odd that Giant-Man, a hero known for being big, is made from Hasbro's "small" body, but remember that when he's just being Hank Pym, he's a pretty average guy. He's got a superhero physique, sure, but he's no Captain America. Like the other uses of this mold, he moves at the head, shoulders, biceps, elbows, wrists, torso, waist, hips, thighs, knees, shins and ankles. He's not, like, a super-dynamic guy, but these are enough joints to give him cool things to do. Giant-Man doesn't have any accessories, but he does come with the right leg of this series' Build-A-Figure, Ultron. This is the movie Ultron, not the one Pym actually created. Hank has some paint issues, but this is still the first time he's been readily available as a Marvel Legend. Still, it just seems strange to get him in 6" scale instead of something bigger.